How was it made? 97% French oak barrels, 97% malolactic, and aged 9 months. According the company literature, this wine should be enjoyed over the next 1-3 years. It’s near the end of April, 2010 right now, so I believe we are reaching the end of this window, let’s see what it has left shall we? On the Nose: Pear Pineapple butter and toast, not necessarily in that order, and it’s not abundantly obvious. The nose is subtle. On the Palate: The Palate is a lot nicer than the nose lets on. The fruit is riper than the nose would suggest. With 97% malolactic fermentation the fruit is predominantly green apple with a little hint of pineapple sweetness interwoven in the oak. I took a trip down to my local Costco to search for markdowns. 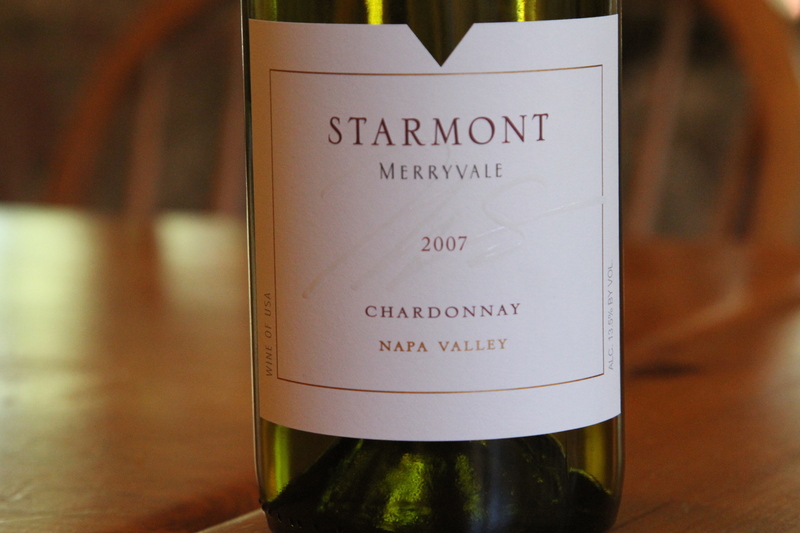 I have enjoyed Starmont Merryvale Cabernet’s so I was interested in trying out the Chardonnay, especially at the reduced price. On the nose, crushed pineapple in heavy syrup. I can say this with certainty because I was making a pineapple marinade for pork tenderloin yesterday and the aroma is very fresh in my mind. Though it is not a very strong aroma, it is definitely present. There is also a citric aspect to it, a slight lemon. On the palate, medium bodied, maybe just a little bit on the light side of medium. The fruit on the palate is Citrus, predominately lemon. It’s smooth, the acidity is quite subdued. The finish is nice, and fairly long. Surprisingly long, tingly, tart and there’s a hint of creamy oak nestled in there as well. My first impression was that I was not wowed by this wine, but I gave it a bit of time to open up and warm up and it really made a big difference. It’s a nice, fairly light, crisp simple straight forward Chardonnay. If you are tired of over oaked over buttery monster California Chardonnay, you will be pleasantly surprised with this effort.